I love celebrating Santes Dwynwen! It's considered to be the Welsh equivalent to Valentines Day, celebrated on the 25th of January. Dwynwen fell in love with Maelon, but unfortunately her father had already arranged that she should marry someone else. In her grief Dwynwen fled to the woods, where she begged God to make her forget Maelon. After falling asleep, Dwynwen was visited by an angel, who appeared carrying a sweet potion designed to erase all memory of Maelon and turn him into a block of ice. God then gave three wishes to Dwynwen. First she wished that Maelon be thawed, second that God meet the hopes and dreams of true lovers and third that she should never marry. All three were fulfilled, and as a mark of her thanks, Dwynwen devoted herself to God's service for the rest of her life. Llanddwyn Island is a very beautiful place to visit, and we're so lucky to be living near by. However, we'll be celebrating Santes Dwynwen on the Isle of Anglesey at our most favourite restaurant! 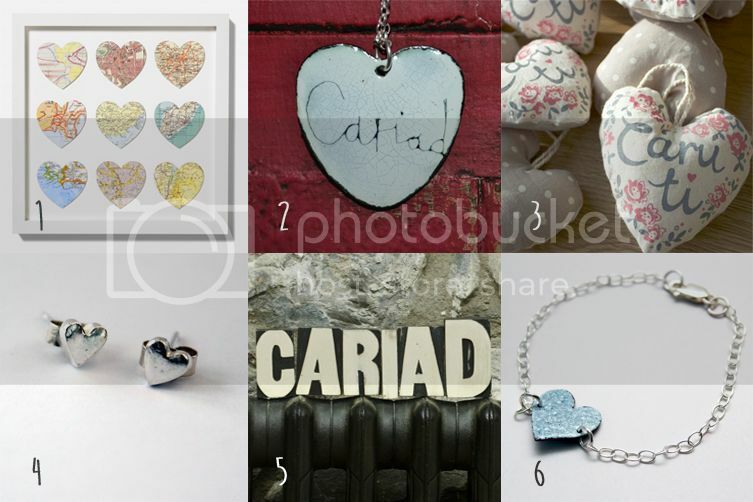 We're saving the pennies this year, but here are some lovely Welsh gift ideas if you're celebrating - I'm in love with Buddug's 'cariad' necklace! I hope you have a lovely week, and weekend - whether you're celebrating Santes Dwynwen or not!